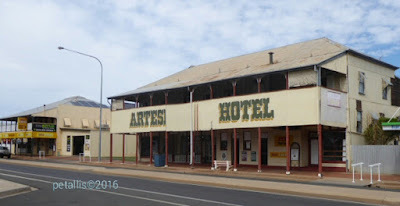 We travelled through Barcaldine twice this trip, but have yet to camp here. The first thing one notices is the large number of pubs. We tried twice to visit the info centre, but both times it was closed - and we visited just before 2 pm on the Thursday, and just after 11 am on the Monday. 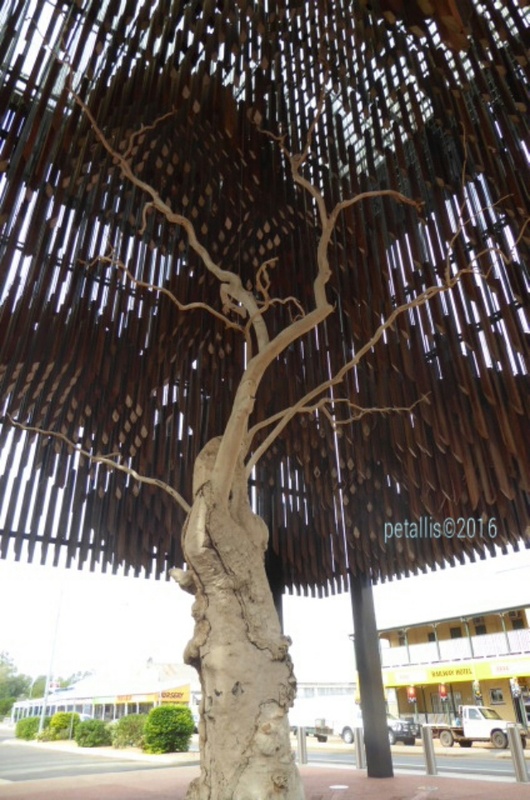 A visit to the Tree of Knowledge which has become an important part of Australia's history. The ghost gum tree is believed to be over 180 years old and the railway station was built near the tree in Oak Street in 1886 and the town developed. In 2006 the tree was poisoned and died. 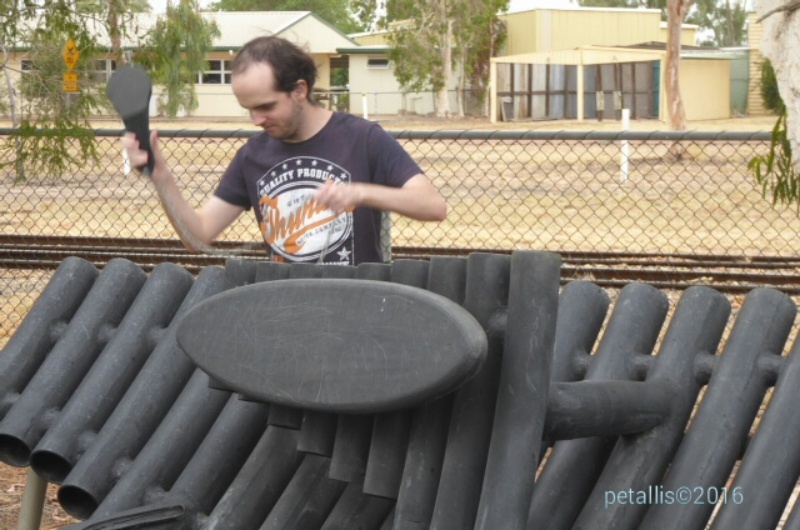 It was preserved in Brisbane and is now under an impressive timber structure. It was made famous by the meetings held beneath it during the 1891 Shearer's Strike, which lead to the formation of the Australian Labor Party. The tree is listed on the Queensland Heritage Register. 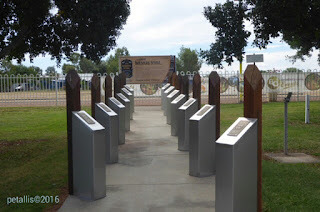 Not far from the Tree of Knowledge is the memorial to the shearers. The name Barcaldine comes from one of the first settlers in the area, Donald Cameron. He was a descendent of the Campbell's of Barcaldine Castle. All the streets are named after trees. 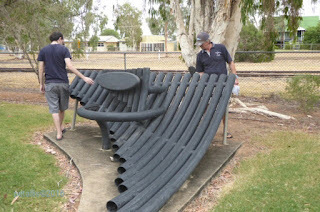 The thong-a-phone and marimba are located in Oak Street and they form part of the public art, and fun to play. I love Art Deco, this is what I think it is. 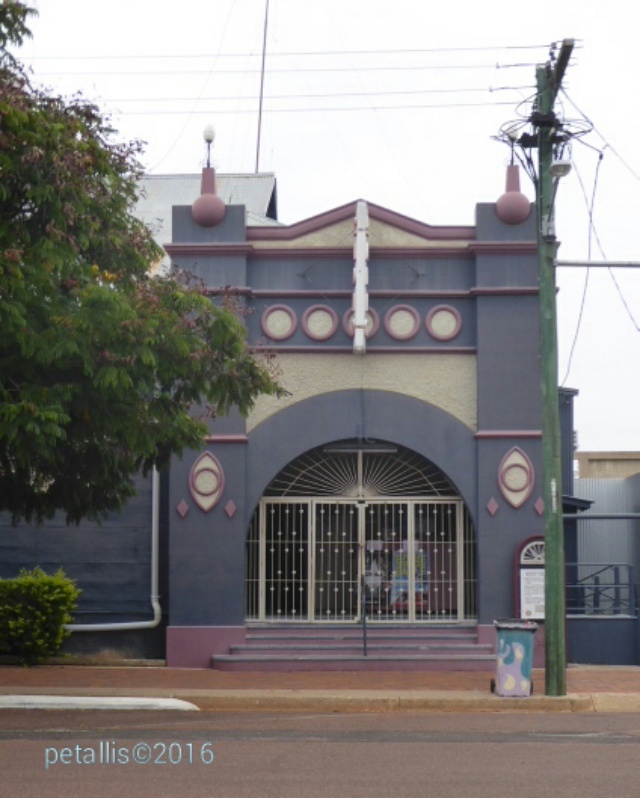 (Please tell me if it is not) The Radio Picture Theatre was opened in 1926 and is still used today. One can see the old canvas deck chairs still used. 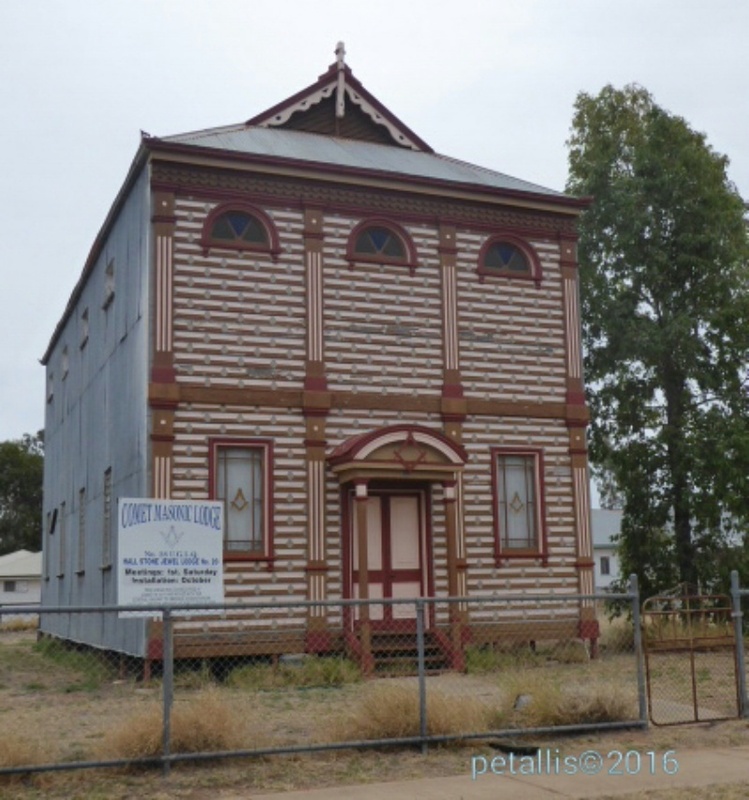 The Masonic Lodge was originally built in 1876 in Dingo Creek. It was located to a few different places before being located in Barcaldine in 1901. 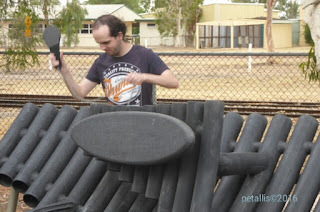 It is made of iron and timber, and the face was painted to look like bricks. 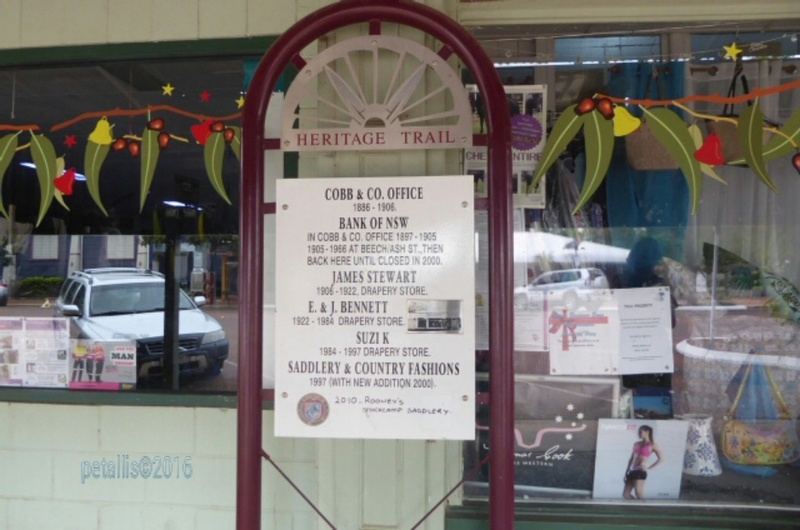 The town has many information boards, this one was interesting because the local shop has written in permanent marker an update.